When you attend a business event, you are putting your best foot forward to say the least - and accessorizing your business suit is a must do! During a business event, details are key. Within seconds, people make judgments about trustworthiness and competence, even Princeton studies tell us this. You’re meeting a myriad of prospective business associates in compressed increments of time, or maybe you’re looking to attract that special prospective employee you need to round out your team, so every little bit helps to make that positive impression. Taking the step to replace the standard non-business professional lanyard with one of Boojee Beads fabulous selections of over 40 chain lanyards will transform your simple business look to a top executive look! Not only will your new chain lanyard change your persona but it will also become a conversation piece for you to talk about with the business executives around you. At Boojee Beads we are constantly looking into the latest styles, trends, colors and premium quality lanyards for our customers. Our founders, Lisa Harrington and Kimberly Martinez strive to create products that not only fulfill the task of holding on to your identification cards in a practical and efficient manner, while also making the wearer feel beautiful and special. 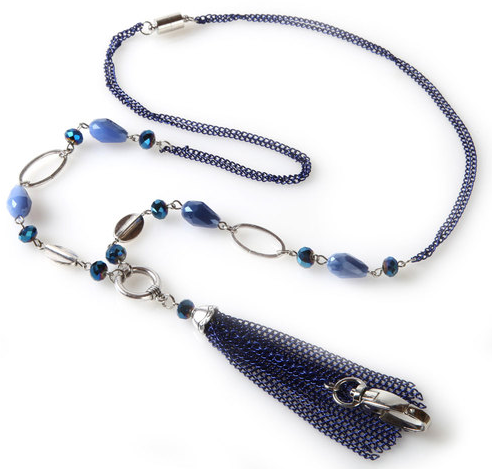 Our Indigo Evening Chain Lanyard uses an exquisite mix of beads with a blue metal chain to elevate your business event look to new glamorous levels. The durable lobster clasp is able to hold not just your ID but also keys, badges, and more. Step outside of your comfort zone and go for the pop of color you so desperately desire while wearing a monotone business suit. There’s elegance to our handmade Pastel Party Chain Lanyard because the subtle pastel beads combined with gold accents truly add class to any business suit and a touch of much-needed color. Go for an ultra glam look with our Gatsby Chain Lanyard that is sure to have heads turning to see everything the gold finish lanyard includes. This lanyard adds a touch of style to any look with fringed tassels, fun flirty charms and, of course, our must-have badge holder clip. This is an all-out glamorous piece in classic, shimmering gold, made fun! Our chain lanyards are delicate and fashionable enough to make the right professional statement every working businesswoman wants to emanate. An extra delicate piece in our collection is the Abacus Chain Lanyard due to its thin gold finish adorned with small blue crystal beads atop oval structures to add a pop of color! This elegant badge holder has a built in safety breakaway clasp to make sure our clients are safe from any tugs or snags causing harm to their skin. The saying, “dress to impress because you never know who you’ll meet” holds true. Your future business partner and your next venture sometimes is all up to how the stars align. Give yourself a little extra luck with an attractive, unique lanyard that says something about yourself. Boojee Beads award winning expert representatives are happy to answer any question about choosing the right business lanyard for you or if you are interested in finding out more about wholesale discounts! We are only a click or call away through our online contact form. Get ready for success with Boojee Beads! Call us at 888-726-6533 or for help picking out your next stand out lanyard for your business event.